Why is September 26, 2007 an important date to remember? The answer is simple. . .before that day 45 years ago, Upsilon did not exist. It was only a dream. 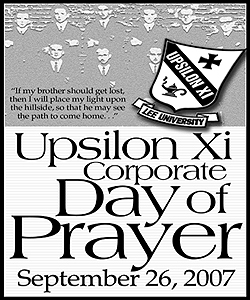 Now, all Upsilon men and women are encouraged to take some time on this day to thank God for all of His graces (including Upsilon), and to pray specifically for those who were in your tap or in the club during your time at Lee. Ask Christ to meet your brothers right where they are, asking Him for strength, healing, help with finances, renewal and restoration for each brother. Even if you do not know your brother's needs, Christ does. Perhaps this is also a great opportunity to make a phone call or two and ask your brothers how they are doing and if they are coming to the 45th in November. For those in the Cleveland area, a special Corporate Prayer will be held in the North Cleveland Church of God Prayer Tower at 6pm. Details will be provided as they become available.